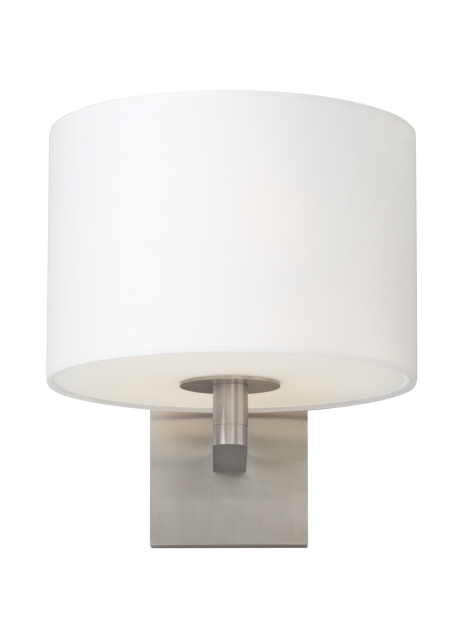 The Chelsea wall sconce light by Tech Lighting is simple and sophisticated with its tailored modern fabric drum. This sleek sconce is composed of a die-cast aluminum base and white glass diffuser allowing for light to be evenly dispersed without an offensive glare. The Chelsea is available in three modern shade colors Black, Heather Gray and White, and is comes in three on-trend finishes. Scaling at 9.3“in width and 9.7” in length the Chelsea is ideal for bathroom lighting, hallway lighting and bedroom lighting flanking two end tables. Available lamping options include energy efficient LED and no-lamp, leaving you the option to light this fixture with your preferred lamping. Glass diffuser provides glare-free lighting experience.